Hunter Lasko is a transfer student from the reigning conference champs; Southern Nevada. A Utah native for the last nine years, Lasko is from Olympus, Utah, where he played outfield and pitched for Olympus High School. He is entering his freshman season and will look to help out the Eagles pitching rotation. Lasko left the Coyotes after finishing fall season with them. He talked about a few reasons for leaving. “ It didn’t feel like baseball anymore, the fun I have playing the game wasn’t there.” He attributes this to the hard strict attitude the program had. Hunter also said he did not like the environment living and playing in Vegas, even after spending three years of his childhood living there. As he compared USUE, to CSN, he had nothing but good to say. 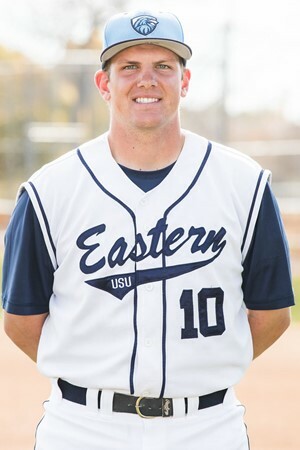 “I like the environment, it more fits my style and actually feels like a real college.” USUE baseball program was first introduced to Lasko by assistant coach Kirk Haney’s father, who is friends with Lasko’s father. “ When telling him about the program Coach Haney said the team could always use more pitching and would love to have me,” Lasko said. Lasko looks to bring his skill to the Eagles squad and also much more. “ I want to build a stronger bond and connection throughout the team.” Hunter feels this would make the team better by coming together and working hard for the common goal which Lasko thinks should be no less than a conference championship. He said this was something they had at Southern Nevada, which he thinks led to the success they had in their fall season. Hopefully Lasko can also bring insight on the defending champs to try and give the Eagles an edge in this upcoming season. “ I know some of their weaknesses and how to get under some players skin.” Lasko would like to go into something related to business, but for now is getting his generals taken care of. He also wants to win championships at USUE and hopes to continue playing. “ My goal is to hopefully earn a scholarship to play at a Division-1 University.” His favorite baseball memory happened in his junior year, where his team played in a tournament in Chicago. He plans on making more baseball memories this season with the Eagles. The Eagles opened the pre-season with a “Battle of the Borders” Tournament at CSN on January 26th and 27th.